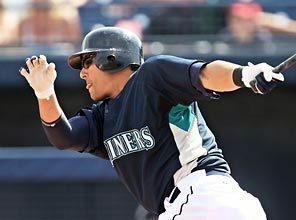 About once a summer the need to talk baseball just overwhelms me and I have to throw out a few thoughts on how to fix the Seattle Mariners. There’s been a lot of scuttlebutt lately about how the M’s might actually be buying in this year’s trading deadline derby. If you ask me, that would be a missed opportunity of a lifetime. Yes, the M’s are in the AL West race but the only way they win this race is by significant upgrades to the starting pitching and run production. The only way to do that at the trading deadline is by trading away young talent. I say, let the Mariners take advantage of another ballclub for a change. The time is right – not to build this team to compete in the post-season in 2009 – but to compete for world championships for the next decade. 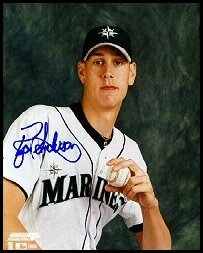 It’s time to SIGNIFICANTLY reload the M’s farm system. Why now? You have the perfect storm right now, that’s why. You have a handful of guys in their contract year; you have veterans like Sweeney and Griffey who can hold a team together and avoid a mess like the Pirates had when they traded Nate McLouth to the Braves; you have a pretty fair amount of parity in most MLB divisions right now, which means more teams may consider themselves to be buyers; and HOPEFULLY, you have a new GM willing to make a signature move with long-term goals for a franchise in desperate need of young talent. My stance on this issue softened a bit with the news that Adrian Beltre would be missing significant time with his shoulder injury – thereby likely reducing his value to at least CLOSE to nothing. Beltre could have been one of our biggest bargaining chips this July – if he could show a little life at the plate and stay healthy. Unfortunately, he did neither and it now looks highly unlikely that the M’s will be able to move him. So with Beltre out of the picture, now what? Who goes?? Jarrod Washburn. I’m actually a fan of Washburn’s. He hasn’t developed a signature “out” pitch, but as he gets more years under his belt, he continues to learn new pitches and has developed more of a sense of how to use them. I won’t bore you with details but this article does a great job of breaking down his early season success. 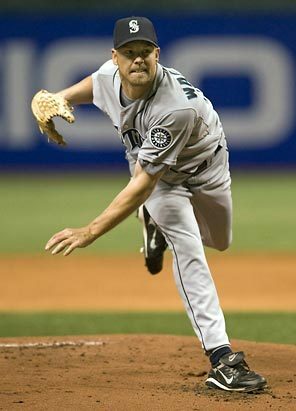 At best, Washburn is a poor man’s Jamie Moyer. He’ll eat up innings, keep you in ballgames and be a positive clubhouse presence. I thought they should have taken whatever they could get for him LAST year. This year, he’s got much more value. 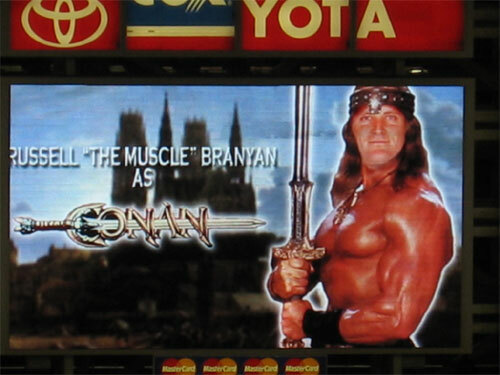 Russell Branyan. Frankly, I’d love to see Russell the Muscle continue on with the M’s but there is absolutely no doubt in my mind that he took this year as the only opportunity of his career to be an everyday starter – and boy has he run with it. I scoffed when he was signed in the off-season – but if Jack Z. can get a couple prospects for him, it could very well go down as one of the best maneuvers ever, by a M’s GM. Fingers, crossed for you, Jack. Erik Bedard. 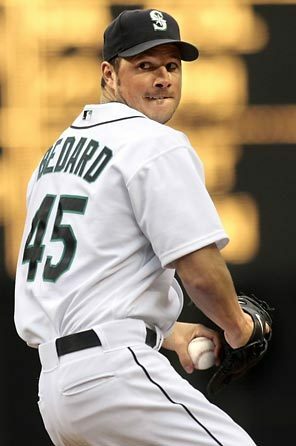 Again, it certainly doesn’t help that he’s been injured but you can’t deny the fact that when healthy, Bedard is about as steady as they come. His value (like that of Washburn) gets the southpaw markup, so if he comes off the DL (reported to be as early as this weekend’s series) and throws well before the All-Star break, he shoots right to the top of this list. Miguel Batista? Count me among the many M’s fans that would have been tempted to push Batista in front of one of Safeco Field’s famous trains if given the chance over the last few years – but now that Batista isn’t being forced to carry the mail as a starter, he’s actually shown to be a fairly reliable middle-innings guy. It will take a desperate team, so keep your eye on other teams’ injury reports and cross your fingers. My guess is that any deadline deal involving these free-agents-to-be will involve the M’s eating a significant portion of their salaries – but hey, it’s an investment in the future. If the M’s are able to get some good young talent in return, it would be a huge step in the right direction. If they want to make a bigger splash, the only player on the roster that is untradeable should be Felix. of opportunity to get top value for these two damaged up-and-comers may have closed – and to be fair, they could both still pan out to be superstars in Seattle – but if there’s an opportunity to look around, take it! Don’t let Morrow become the next Ryan Anderson! If you don’t follow the M’s with even a little bit of interest, you may not know who Mike Morse is – and you almost certainly missed that the M’s just traded him for former Alanta prospect Ryan Langerhans. Every so often in baseball, I fall in love with a prospect and just don’t let go. Russel Branyan was actually one of those guys early in his career but I eventually DID give up on him. Hank Blalock is another one. I’m still convinced that if he gets a regular job and stays healthy, he’ll be a .300/25/90 guy every year. Mike Morse was that guy for me on the Mariners roster. Morse absolutely tore it up in spring training last year and made the team out of camp, only to be sidelined by another injury. With the arrival of Sweeney, Griffey and Cedeno this off-season, Morse seemed to get lost in the shuffle. Now, Yuniesky Betancourt is sidelined by an injury and Morse is in Tacoma hitting .312 with 10 dingers and 52 RBI … and he gets traded? Makes you wonder if there’s some kind of personality conflict there. I’d say odds are that Morse winds up being another in the very long line of productive former Marniers that litter MLB rosters past and present. One way or another, the M’s have the ability to make July baseball in Seattle fun again. If you’ve given up on them, now’s a good time to tune back in. If you’re a baseball child of the 70’s and 80’s like me, you may have grown up watching your favorite team compete on the road in powder blues. 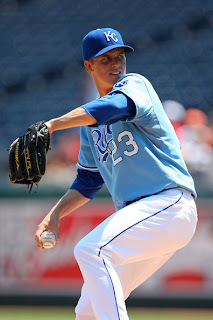 The Royals have been flirting with going back to the blues with their alternate powder top – but they wear them with home white pants. It looks awful. Ever since I saw those powder tops I’ve been hoping some team would bring them back full time. Toronto played in full powder blue throwbacks the other night and I am now convinced that we need more! Bring back the powder blues!! You are currently browsing the archives for the Mike Morse category.